No trip to Tunis would be complete without taking in the Tunisians’ extraordinary wealth of culture. What better way to get a real sense of their history than at the Bardo Museum. The magnificent Bardo Museum, once a 15th-century Hafsid palace, has undergone a massive redevelopment. Walking into the expansive foyer of the monumental new wing I was immediately struck by the stunning 10-metre high mosaic, which has been painstakingly hung upon the back wall. 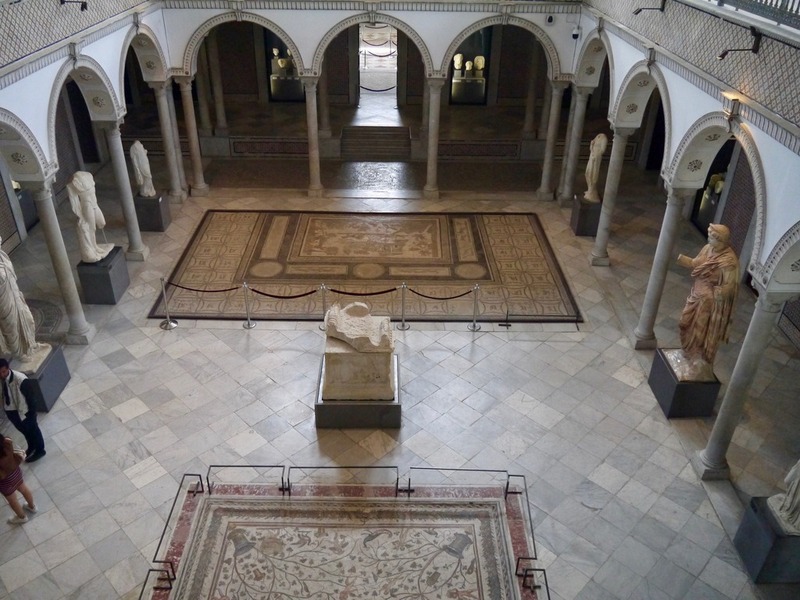 The Bardo Museum contains the largest collection of mosaics in the world and is celebrated for its extensive range of regional antiquities. 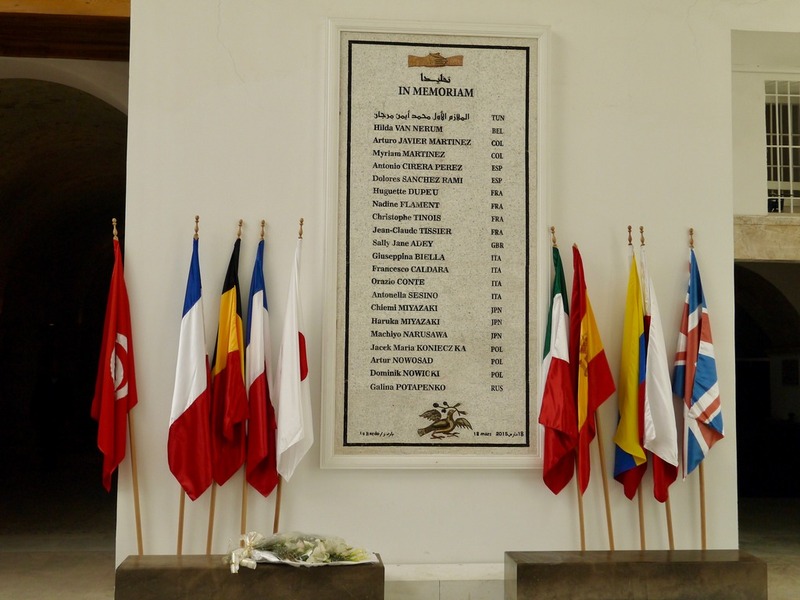 Also in the foyer is a moving monument and memorial plaque, flanked by international flags, which pays its respect to those that tragically died in the horrific terrorist attack in 2015. The museum provides a wonderful opportunity to better understand the heritage and land of the Tunisian people, a country that has seen so much change over the centuries, it tells the story of Tunisia’s development from the Classical era onwards, with Roman, early Christian, and Islamic artworks and everyday items displayed in themed rooms. We were given an extensive a guided tour around the Bardo Museum by the lovely and extremely knowledgeable Azia, which gave us all a real insight into Tunisia’s rich and expansive art and culture. 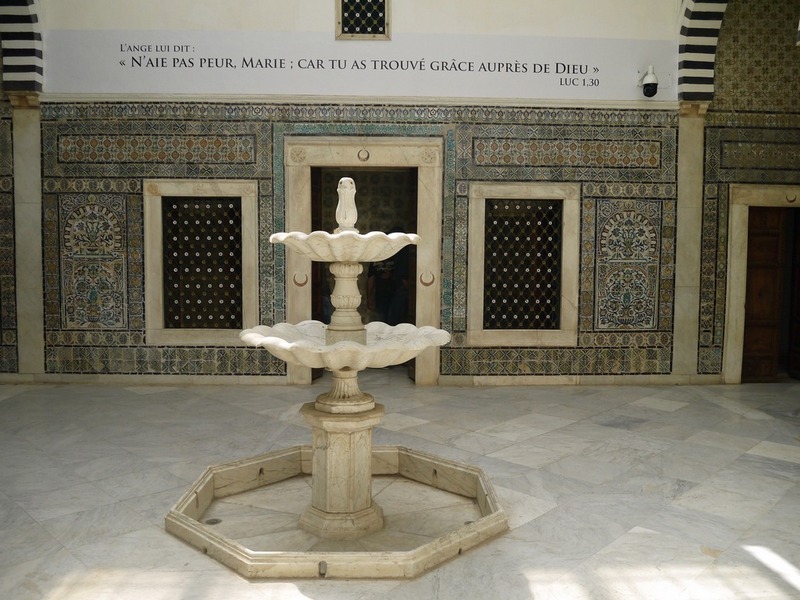 The Bardo Museum should be on top of everyone’s list of things to do when visiting Tunis. There are some truly beautiful artefacts and I particularly loved the mosaics, which adorned the walls and floors as you walked through the labyrinth of this exquisite building. I will be sure to go back again as there is so much more to discover and take in. 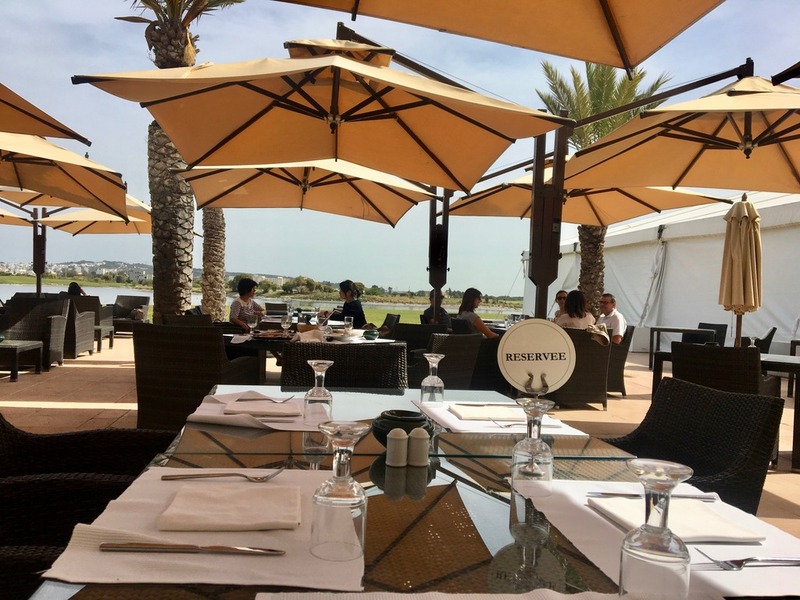 Now I’m not a golfer by any stretch of the imagination, but we were taken for lunch at the Golf Residence, a popular destination for the Tunis golfing crowd. The sun was shining, so we sat outside which provided a welcome dose of vitamin D after a morning inside the museum. The tranquil setting overlooked a small lake, with an expansive view of the hilly green lawns with the city on the horizon. With a glass of chilled rose in hand, and a selection of crusty bread rolls and a spicy harissa dip, we had got off to a very good start! I ate warm spicy Prawn Ojja, which is a combination of prawns, tomato, peppers with egg and spices, and was absolutely delicious. 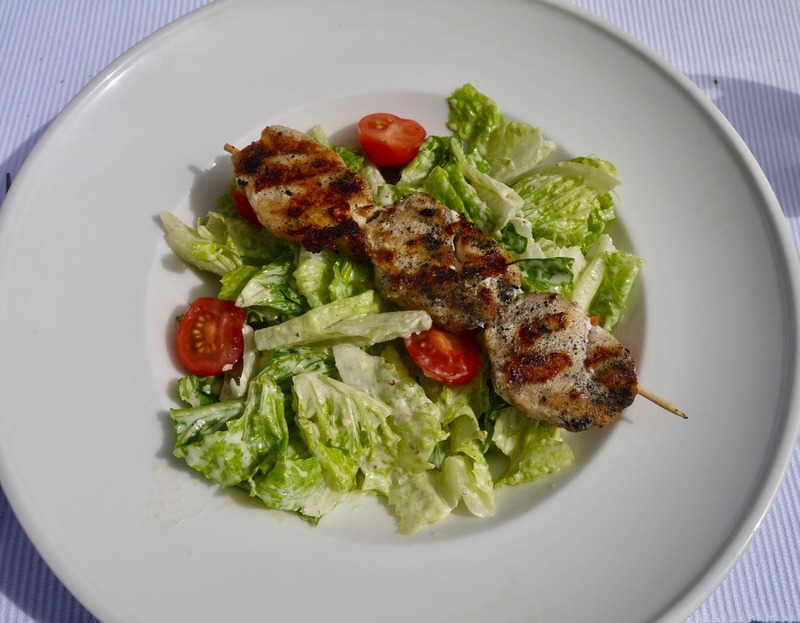 Followed by a grilled chicken Caesar salad, fresh fruit and some strong black coffee, a perfect way to spend an afternoon. 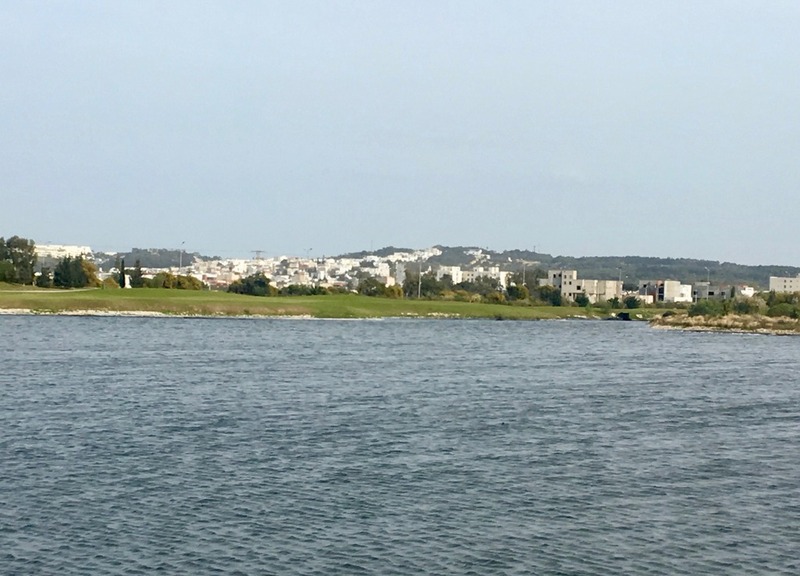 On route to our next destination, we drove along the stunning coastline and had we had more time I would have loved to have been able to stop and visit the fashionable town and pretty beach resort of La Marsa Corniche, once known as the wild city. Our guide Moncef told us that all the young Tunisians descend upon it on weekends to walk along the promenade. They shop at Zephyr, frequent the coffee shops; eat brik pancakes and bambalouni and buy ice cream at the popular Au Petit Salem. On the sea front is the famous boutique hotel – Dar El Marsa, so I am rather hoping that on my next visit I will be able to check it out. 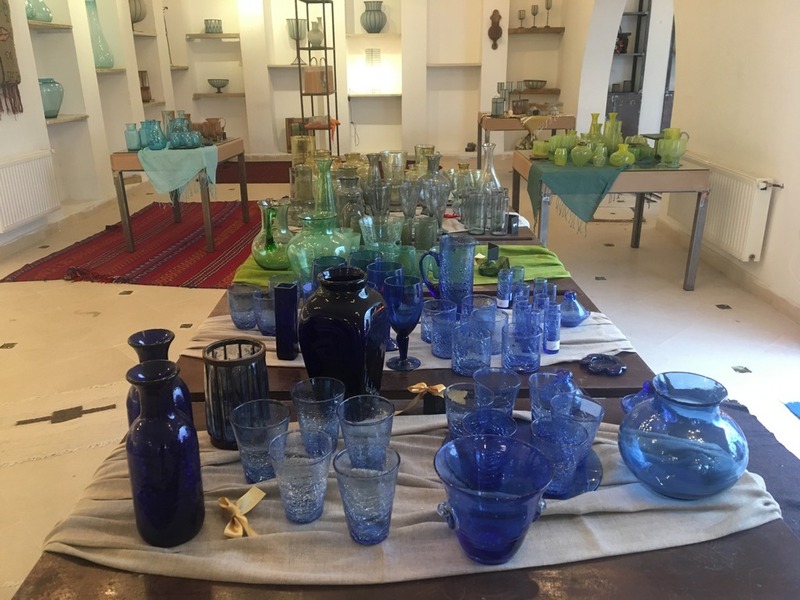 On our final day, we visited the studio of renowned Tunisian glassblowing artist Sadika Keskes. Tucked away under the trees, in a pretty garden full of sculptures and creative constructions, is Sadika’s world. This wonderful cultural centre not only provides a studio for glass blowers, but there is also an art gallery open to other artists, a shop, a small outdoor theatre, four artists’ studios and an exhibition room. Saskia was educated in the Fine Arts of Tunis and trained as a master glassmaker in Murano, near Venice. In 1993, she set up her first glass blowing company here in Gammarth, where she also is dedicated to training young students. Sadika’s beautiful home is also here on the site. 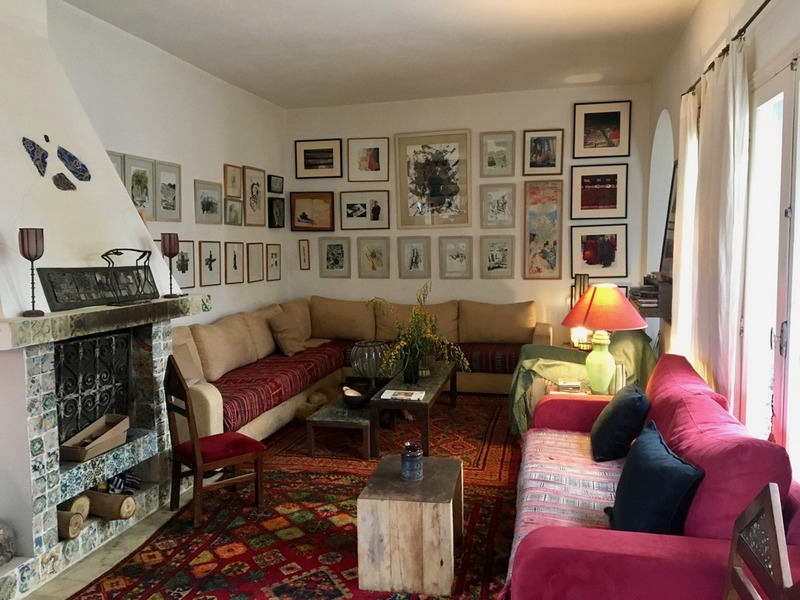 We were delighted to be invited into her unique house which is full of artistic charm and style, we were given such a warm welcome and were served thick, cardamom-scented coffee and delicious small date pastries, whilst she told us about some of her many incredible projects. 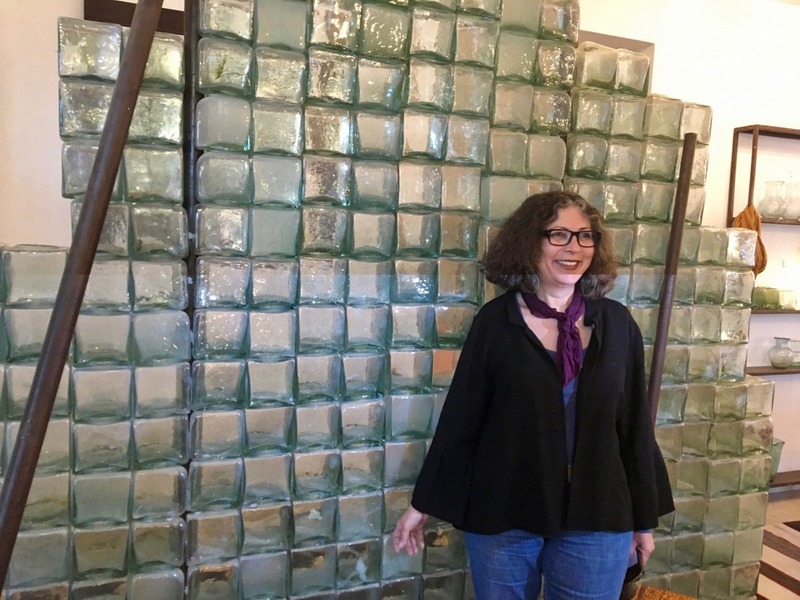 Not only does Sadika make glass both on a small and large scale but she is deeply passionate about her work, she is ethically and political driven and she is a strong advocate of woman’s rights. Working for charities and local organisations as well as doing major international projects. In 2011 she displayed in Genevieve at the United Nations congress meeting. I really enjoyed meeting such a wonderful, warm and talented woman and what a great place to visit to get a real taste of the artistic Tunisian community. And of course, you can finish off by browsing in the lovely shop and maybe take home some hand-blown glass or other art and crafts all made by local artists. Now as much as food feeds the belly and culture feeds the mind and soul. 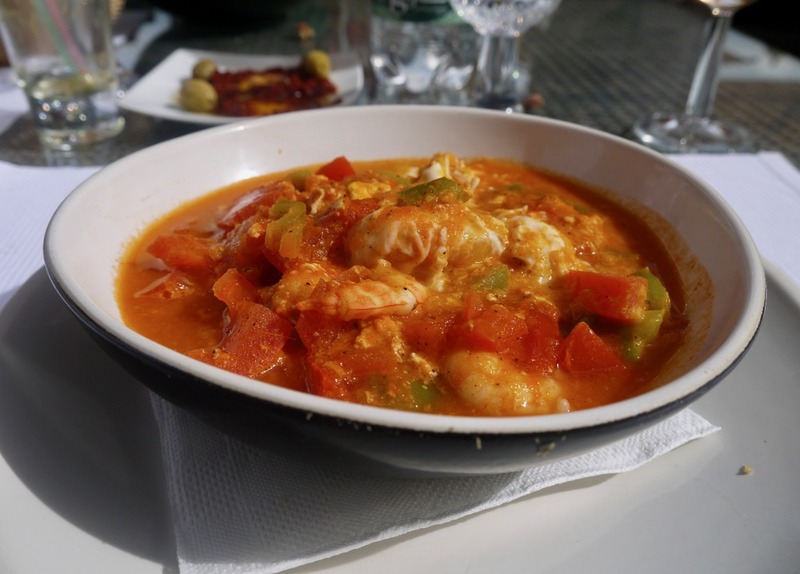 No trip to Tunisia would be considered complete without a real authentic experience. 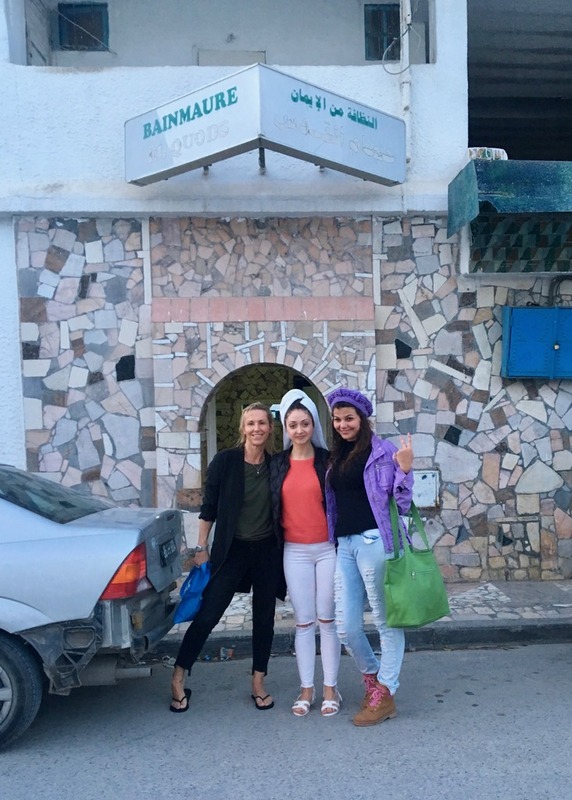 We were fortunate to be shown around by Sanna, a lovely young woman who lives in Tunis and grew up going to the local Hamman, where women go to wash, scrub and to be massaged. Sanna very sweetly treated us ladies to a visit to the local Hamman. When we arrived all heads turned, I don’t suppose they were used to seeing fair skinned blonds on the premises. However we quickly went unnoticed, as there’s no room for modesty here and once I was stripped down to the bare minimum, and wet to my core I looked just like everyone else. Lying on the large marble slabs, you have to be prepared to be manhandled, I was scrubbed down (twice) and then massaged all over with a kind of mud, and then rinsed with large buckets of water. My masseur was absolutely brilliant, I felt totally relaxed in her expert hands, and I have never felt so clean! And to add to the experience, on the day of our visit the atmosphere was celebratory – Arabic music played and some of the women were dancing and we were handed small almond cakes, apparently, it was a hen party! So with short, direct, flights from the UK; far better weather and probably some of the most beautiful views I have ever seen, I cannot recommend visiting this wonderful, North African country highly enough. This sounds and looks like such an interesting museum! I have never visited Tunisia, but y parents have and have always spoken about the unique culture and vibe there. I hope to visit one day! Museums are windows to the culture and heritage of a place. 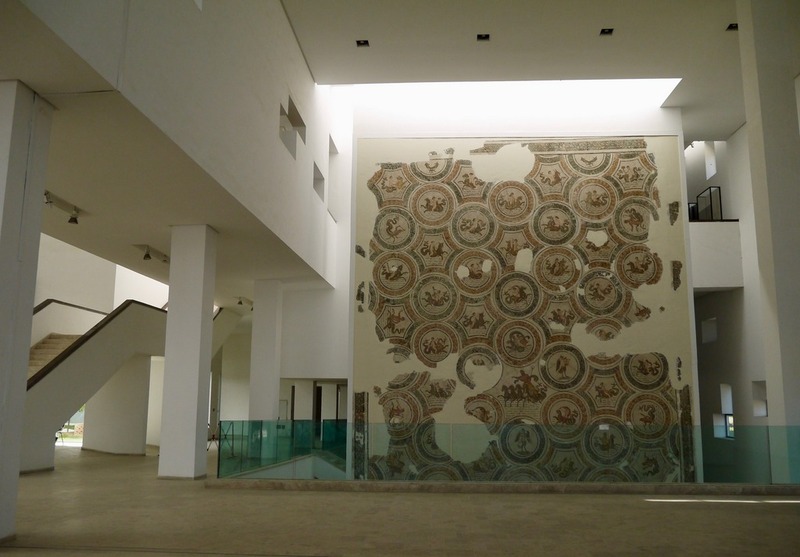 The Bardo museum seems to be a great place to learn about the cultural heritage of Tunisia. The mosaic looks exquisite, a silent testimony to the artistic genius of people of the past. I was in Tunis when I was 15 years old. We went to the mosaic museum. It might be the same as the Bardo Museum. It was beautiful, although I got very sick from the water. Looks like you had an awesome trip there! This was a nice itinerary to Tunisia. The museum’s works of art look exotic and beautiful. The mosaics look like they were drawn by women. I would love to see the creations of Sadika. I am fascinated with glassblowing. I have read great reviews about Hamman massage. It sounds really rejuvenating. Overall, your trip was really good. I’d love to visit Tunisia too someday. 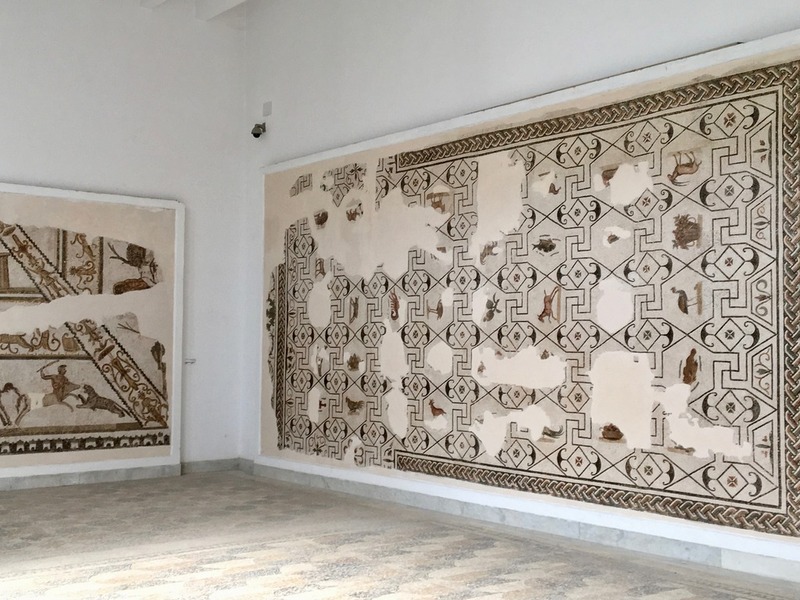 It is really unfortunate what happened in Bardo museum, and also in Sousse. I am glad you visited the first place, I think we should be getting back to places even after such a terrible history. Especially taken in account that Tunisia is just such a great country! I spend there 10 days last year so I can tell. The culture and architecture in Tunisia look stunning. I know, for Brits, Tunisia has a bad rep because of past terrorist attacks but I would love to visit the country. I absolutely love the architecture in Tunisia. Went there a few years ago for a short visit but I would love to go back. 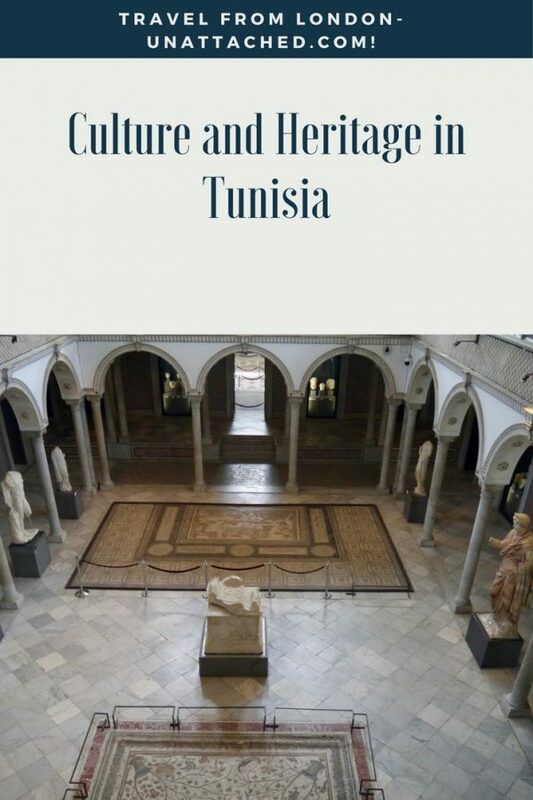 Sounds like a wonderful experience in Tunis – I would love to visit the Bardo Museum, and a traditional Hamman. The museum looks beautiful, how fitting to have a history museum housed in a historic palace – the murals are absolutely stunning. I think Tunis might be an incredibly underrated destination. Love the Bardo Museum. Portrays a lot of the about the country. The food looks really delicious. It really is well worth a visit, it boasts such a wealth of culture and beautiful locations to visit.